It’s a top-heavy class of outside linebackers in 2019. There is one elite prospect leading the group and another who figures to be chosen in the first round, but after that there could be a bit of a wait until the next one is selected. Keep in mind: Some players who were defensive ends in college may be classified as outside linebackers in the NFL, and vice versa, depending on the scheme run by the team choosing them. “The depth is outstanding, but I don't know that you would say the guys you're going to get there would have been top-10 players because we've had depth at other positions in those previous drafts,” NFL Network draft analyst Daniel Jeremiah said. “But I do think you're going to get solid value-type guys in the 20s, just really, really good football players, and I don't think that's – I don't think you're getting some top-10 type player, but you're going to be able to find a really, really solid football player. “This draft class features a number of quarterback hunters with the right combination of athleticism, strength and skill to become double-digit-sack producers early in their respective careers,” NFL Network analyst Bucky Brooks wrote in his positional rankings on NFL.com. 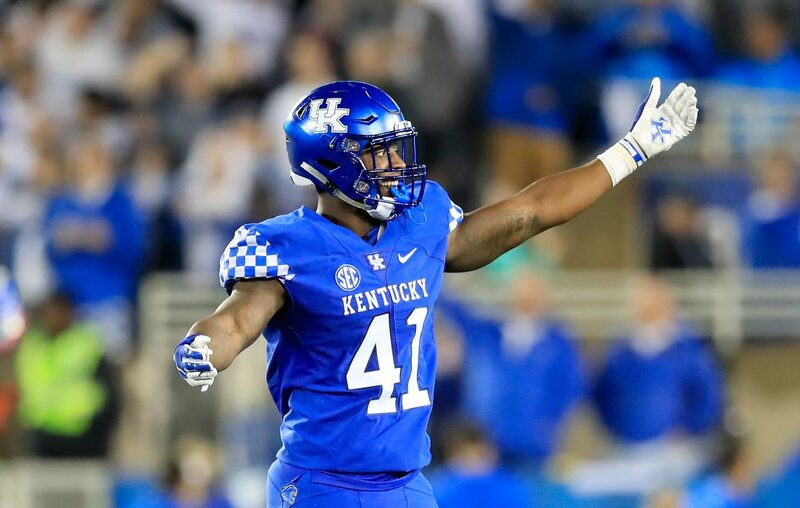 The best: Josh Allen, Kentucky. Another Josh Allen is going in the first round this year, and this one might beat out the Bills’ quarterback being chosen seventh overall in 2018. The Wildcats’ Josh Allen looks to be a top-five lock. He probably could have been a first-round draft pick last year, but elected to return for his senior season. The move paid off, as Allen won the Bednarik Award and the Nagurski Trophy. He was also a first-team All-American and made the All-SEC first team. Bills view: It’s more about depth here than anything else for the Bills, who use a base 4-3 defensive scheme. The starting trio of Lorenzo Alexander, Tremaine Edmunds and Matt Milano is solid. Alexander, though, has already announced that the 2019 season will be his last, so adding a player to groom behind him would be nice. The bulk of Buffalo’s pass rush will come from the defensive line, so any outside linebackers the team is interested in this year would likely be special teams contributors at first. Finding a younger Alexander, a player who can both rush the passer and play the run, would be nice, but it’s not a top priority, at least for the first two days of the draft. Free fallin’: Florida’s Jachai Polite was viewed as a potential first-round draft pick after a 2018 season in which he made 17.5 tackles for loss and was named a second-team All-American. Since the season ended, however, Polite’s draft stock has plummeted. He reportedly bombed the combine interviews, and his workouts have been uninspiring (possibly due to a hamstring injury). Polite is expected to be drafted in the third or fourth round. Overcoming the odds: When he was a junior in high school, Michigan’s Chase Winovich tripped over a garbage bag on his front step and suffered a fractured skull and subdural hematoma as a result of the fall. He survived the accident and went on to become a key contributor for the Wolverines. As a senior, he started all 13 games and was chosen first-team All-Big Ten and third-team All-American. He led Michigan with 17 tackles for loss, a total that included five sacks. Sleeper: Jamal Davis, Akron. A 6-foot-3-inch, 233-pounder, Davis had 82 tackles, including 16 for losses, 5.5 sacks and six passes defensed in 2018. He could be chosen early on Day Three. 1. Josh Allen*, Kentucky, 6 feet, 5 inches, 262 pounds. New Jersey native has been widely rumored to be in the running to join his home-state team – the Jets. 2. Brian Burns*, Florida St., 6 feet, 5 inches, 249 pounds. A former basketball player, Burns is athletic enough to do more than just rush the passer. 3. Chase Winovich, Michigan, 6 feet, 3 inches, 256 pounds. Has drawn comparisons to Clay Matthews, and not just because both players have long, flowing blonde hair. 4. Jachai Polite, Florida, 6 feet, 3 inches, 258 pounds. Led the nation with six forced fumbles in 2018, a Florida program record, to go with 11 sacks. 5. Germaine Pratt, North Carolina St., 6 feet, 3 inches, 240 pounds. Former free safety has just one year of starting experience. 6. D’Andre Walker, Georgia, 6 feet, 2 inches, 251 pounds. Had 7.5 sacks in 2018 – his only season as a starter. 7. Vosean Joseph*, Florida, 6 feet, 1 inch, 230 pounds. Scouts have a wide range of opinions after watching Joseph’s tape. Some of it is great, some of it is the opposite. 8. Ben Banogu, TCU, 6 feet, 3 inches, 250 pounds. Lightly recruited out of high school, Banogu had two highly productive seasons with the Horned Frogs. 9. Drue Tranquill, Notre Dame, 6 feet, 1 inches, 234 pounds. A two-time captain for the Irish, Tranquill had 86 tackles and 3.5 sacks as a senior. 10. Justin Hollins, Oregon, 6 feet, 5 inches, 248 pounds. Ran a 4.5-second 40-yard dash at the NFL combine. His five forced fumbles in 2018 tied for second most in the FBS.